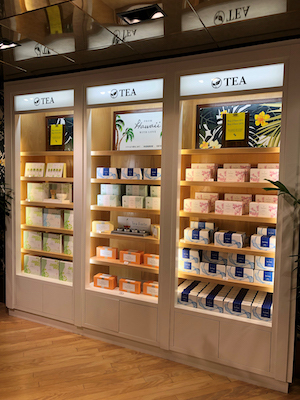 Tea Forte recently launched with Dufry in 12 locations throughout Europe as part of Dufry’s “Tea & Biscuit” concept, reports Tea Forte’s travel retail distributors, Actium. This concept takes the classic pairing of tea and biscuits/cookies and conveniently presents it to shoppers for an exciting way to experience both product categories. Tea Forte’s unique, patented pyramid design and award-winning blends “elevate the classic tea time,” says Hanan Fraysse, LifeStyle and Beauty Division Director at Actium. Tea Forte will soon be launching in additional airports in Europe, the Americas and Asia with Dufry. Tea Forte will also be participating in DFS’ “From DFS with Love” campaign for a second year, giving the brand a platform to showcase and sample its variety of teas and exceptional experience. Tea Forte is also developing location specific packaging for the campaign, enhancing the gift giving opportunities, says Fraysse.